Michael Curtiz directed more than 150 films in his 50-year career, but he's mostly known for Casablanca. 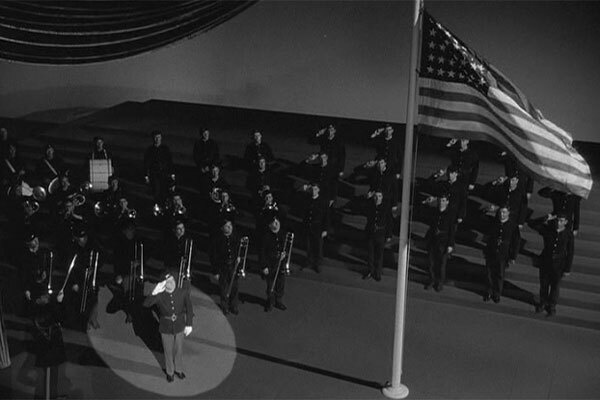 His other movie from 1942 was Yankee Doodle Dandy, a biopic about the life of George M. Cohan. The song-and-dance man became an American institution with songs like "The Yankee Doodle Dandy Boy" and "You're a Grand Old Flag". James Cagney plays Cohan and delivers an Oscar-winning performance in the energetic role. This picture was #100 on the first AFI Top 100 list, so it seemed certain to drop off the ranking 10 years later. Surprisingly, this resilient film moved up two spots to #98, which is a testament to the staying power of the 70-year-old movie. The writers made a lot of changes to Cohan's life for dramatic purposes, but that hasn't diluted the impact of this performance. I remember being forced to sing his patriotic songs in school and had no idea where they originated. A middle-aged George M. Cohan (James Cagney) is called over to the White House after a show where he portrays Franklin D. Roosevelt. While chatting with the President, he flashes back to his younger days and recalls his rise to fame in the theater. Cohan was part of a vaudeville troupe along with his father Jerry (Walter Huston), mother Nellie (Rosemary DeCamp), and sister Josie (Jeanne Cagney). They achieve moderate success, but he wants a lot more and strives to become a musical superstar. He eventually gains success with songs that are still well-known today. Cohan also begins a lifelong relationship with Mary (Joan Leslie), a performer that he meets at a young age. His popularity rises and falls over the years, but his impact remains when troops prepare for wars overseas. Yankee Doodle Dandy is a story of the American dream. An idealistic son of Irish immigrants refuses to accept the life of vaudeville performers and thinks bigger. When Republicans proclaim the myth of the self-made man, they could be talking about George M. Cohan. Through pure force of will and an eye for opportunity, he becomes one of the marquee names in musical theater. Writers Robert Muckner and Edmund Joseph place a few small obstacles in front of Cohan, but they're never serious threats. The other major theme is patriotism, especially with America's forays into wars. Cohan's songs have become examples of the type of blind pride in the U.S. that feels a bit out of place today. The movie shares that optimistic tone of American superiority in the military realm. The story closes with Cohan marching with wind-eyed soldiers while singing loudly to his tune "Over There" while prepping to fight in World War II. There's no doubt that Curtiz and the writers were inspired by the fervor of that war in 1942, and that tone is all over this movie. There are some dated elements, particularly the overly positive outlook on wars and American exceptionalism. The musical style also isn't going to work for some because it hearkens back to the sounds of the early 20th century. That said, there's still plenty of material that should work for modern audiences. Most of us can identify with Cohan's drive to succeed despite the negative claims of his detractors. He's a single-minded guy who's willing to sacrifice the well-being of his parents and sister to reach the top. Cohan doesn't look at his ambitions as hurting their chances, but they do create some headaches. While the movie maintains an upbeat tone about his drive, we see the downsides on his family when he turns down promising jobs. 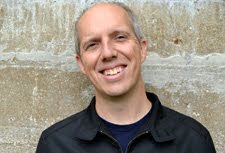 Less effective is the love story, which makes Mary a bit player in his biography. She's a partner throughout his adult life, but there are only a few moments where she's a key figure. 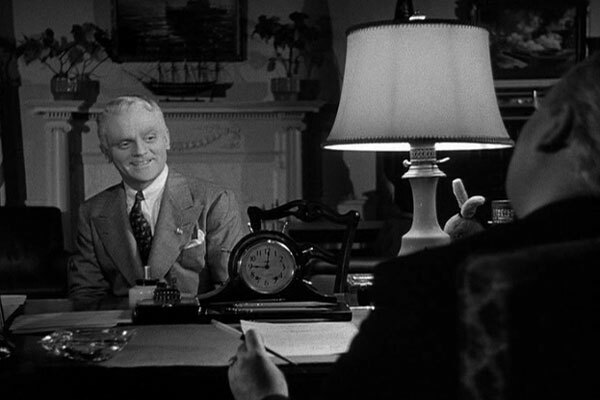 James Cagney deserves tremendous credit for the lead role and carries the film for more than two hours. His on-stage presence is remarkable and makes it clear why Cohan became a star. His unique style incorporates an interesting method of speaking the lines along with the singing to provide the right emphasis. 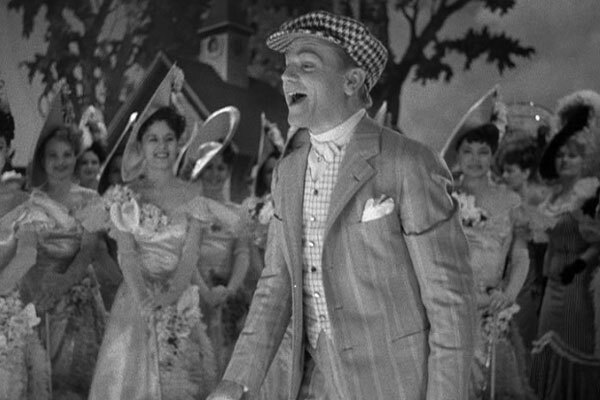 Cagney glides along the stage and exudes confidence; his vaudeville background pays major dividends. He's known more for his gangster parts, but it doesn't seem out of character. Another strong performance comes from Walter Huston as his father Jerry, who plays a key part in his life. His deathbed scene is poignant and works because of the believable connection between the father and son. 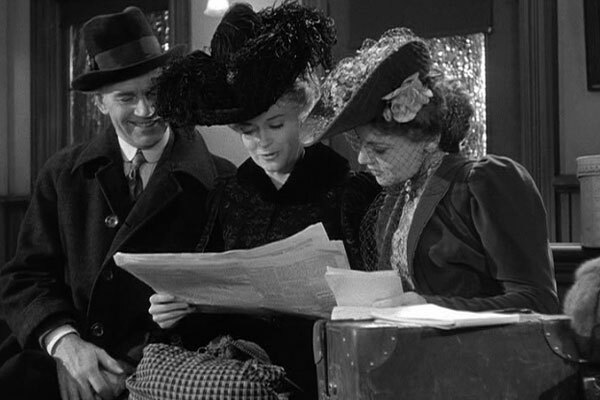 Although the performances are solid, we don't see as much from Rosemary Decamp and Jeanne Cagney as his mother and sister. We never doubt the characters, but they aren't given the same prominence. I must also mention Art Gilmore's strange vocal work as FDR. We only view him from behind, and his voice is probably an accurate imitation. It just feels way over the top, which stretches the believability. There are extended musical sequences that breathe life into this biopic. The highlight is the rendition of "The Yankee Doodle Dandy Boy", which feels like a stage performance that could wow the audience. This feeling of authenticity appears during each theater sequence and provides great energy. Another fun scene involves Cohan and Sam Harris (Richard Whorf) convincing an unsuspecting guy that he must buy their play. Although they've never met, the duo realizes this is an opportunity and improvises perfectly. 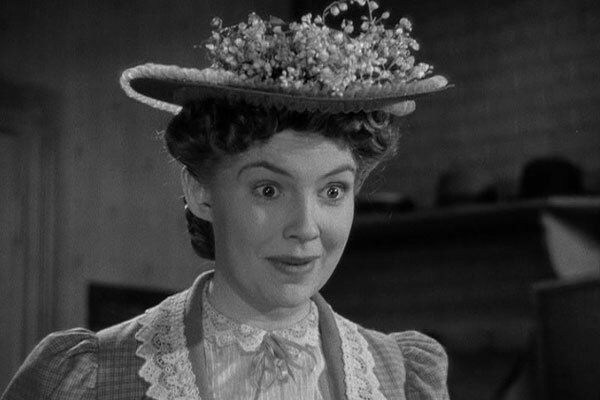 Less inspiring are the scenes involving famous actress Fay Templeton (Irene Manning), who appears in Cohan's play Forty-Five Minutes from Broadway. Although I'm guessing this was important in his career and well-known to audiences at the time, it feels out of place. She never appears again in the movie, so it's unclear why this occupies so much screen time. 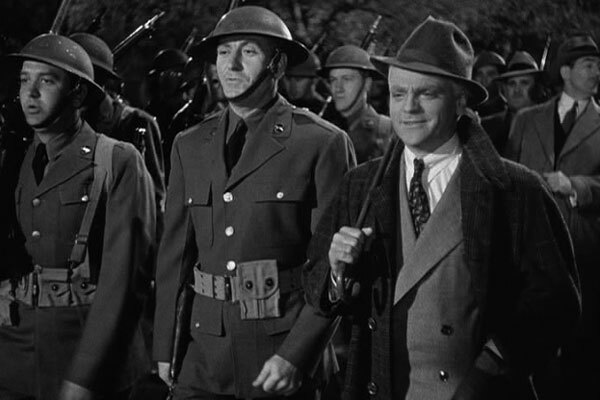 Yankee Doodle Dandy is an easy film to dismiss because of its overly patriotic and sentimental tone. It's clearly designed to rouse audiences to support American involvement in World War II. That side of the story feels dated and pulls it down beneath what you're expect from such a regarded movie. That said, Cagney's stunning performance helps to overcome those issues and makes it a worthy choice. I don't believe it deserves a high ranking but don't have a problem seeing it in the 98th spot. The flashback structure feels conventional today yet doesn't grow very tiresome because of Cagney. We're ready to take the ride and can forgive the faults because Cohan's such an engaging character. Next week, I'll journey to Jerusalem and ride the chariots with Charlton Heston in Ben-Hur. Nice review, Dan. I agree on Cagney's great performance, which proves he could play more than just gangster roles. While I recognize the significance of the film in terms of the development of American cinema, I think I would be more suited to a list of honorable mentions than a spot in the top 100. Still, #98 is a fitting spot for it, since it did make the list. Thanks Josh. This movie's definitely right on the edge of being worthy of this type of list. I agree that when you get past Cagney's performance, the rest doesn't hold up to that level. Still, I enjoyed catching up with it. I like this film quite a bit and don't have a problem with it being on AFI's top 100 list. I completely agree that this is Cagney's film from beginning to end and I consider his role of a lifetime. One thing that shows how well suited he was for the role - at the end of the film where he's walking down the stairs and suddenly just starts tap dancing down them to the bottom - that wasn't in the script. Cagney just improvised that on the spot and they kept it in the film. Chip, I did read that Cagney did that move on his own, and it's a great scene. He definitely owns this role, which felt like a departure but wasn't really because of his background.